Students often find it difficult to know where to begin when searching on the internet. 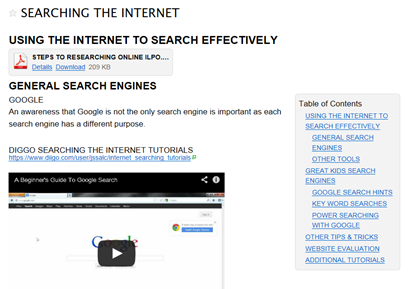 I have put together Steps to Online Researching with suggested search engines for students on my JSSALC Library wiki. SEARCHING THE INTERNET is a collection of Youtube videos, internet links, search hints and tips all gathered in one handy location. Additionally, the JS Library Virtual Library ONLINE TOOLS for INFORMATION LITERACY has ICT tools matched to the research process. More links can be found at INTERNET SEARCHING TUTORIALS (my DIGGO JSSALC bookmarks). The skills outlined in the following tutorial videos are essential for all users of Google (as most of us are!). REWORDIFY is a website that simplifies the content to assist you to read complex webpages. This entry was posted in ICT, Information Literacy, Information Process, Library, Research Process. Bookmark the permalink.